It was not meant to be on Sunday for the Joliet Generals. Having to win the first game today in order to play the second, the Generals fell 4-1 to the Southland Vikings. The loss on the final day of the regular season officially eliminated Joliet from playoff contention. Jordan Baker got the start for the Generals. Baker followed up a one-two-three first with another solid inning in the second. But he ran into trouble in the third after walking the leadoff batter, Nick McAlister. A few pitches later, McAlister started to steal second and then ended up going all the way to third because of a passed ball. That same batter, Vikings outfielder Gerard Powell singled to bring in the go-ahead run. Powell also scored later in the inning. Southland added two more runs in the fifth to expand their lead to four. 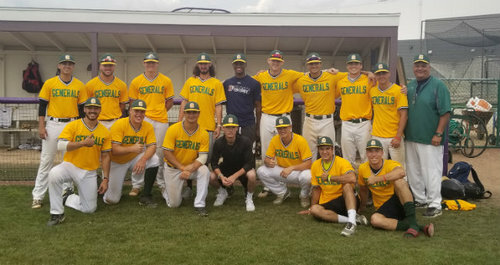 After scoring 16 runs yesterday in game two of the doubleheader against the Bobcats, the Generals failed to keep that offensive momentum going today. Through the first four innings, Jack Kraus had both of the only two Joliet hits. Finally, the Generals showed some muscle in the sixth, when Joe Scaffidi hit a one-out double. The next batter, Thomas Larson, hit a double himself to bring Scaffidi in to score. Unfortunately, the threat ended shortly afterward with Larson being stranded at third. The score remained the same to the end with the Vikings holding on for a 4-1 win. In his first year coaching in the Midwest Collegiate League, Hernandez managed his team to the cusp of the playoffs. Despite the disappointing end, he believes his guys have become better baseball players while having fun.